This B&H Kit bundles two Sony 128GB SF-G Series UHS-II SDXC Memory Card, for a total capacity of 256GB. 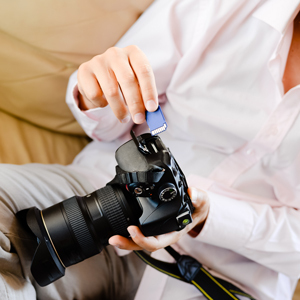 Use one card in each slot of a camera with dual SD slots, or if your camera only has one SD slot, keep an extra card handy in case your primary one fills up. The 128GB SF-G Series UHS-II SDXC Memory Card from Sony features a storage capacity of 128GB and takes advantage of the UHS-II bus to support advanced DSLR functions such as continuous shutter bursts and rapid shooting, as well as RAW and JPEG captures. This card is also well-suited for video capture, including 4K, 3D, HFR, and Full HD video, and can achieve maximum read speeds of up to 300 MB/s and maximum write speeds of up to 299 MB/s. Thanks to its U3 speed class rating, minimum write speeds are guaranteed not to drop below 30 MB/s. UHS-II media achieves its speed through an extra row of pins and while this card has been designed for cameras that are UHS-II compatible, it may be used in devices that do not support UHS-II. However, bear in mind that this card will then default to your device's speed class and bus rating, such as UHS-I and U3. If your device does not support U3, this card is compatible with the U1 and Class 10 standards, each of which guarantees minimum write speeds of 10 MB/s. 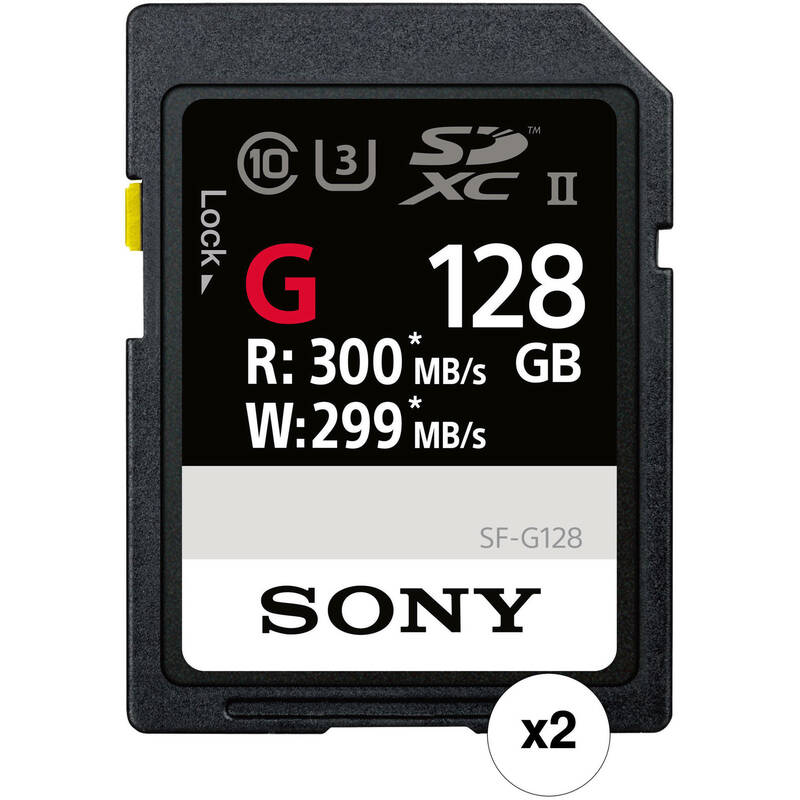 As with most Sony cards, this memory card is shockproof, X-ray proof, and waterproof, while also being able to withstand temperatures from -13 to 185°F, allowing you to take this card with you into extreme environments, such as snow and deserts. Should the card's data become compromised, you also benefit from the option to download File Rescue software for free to help recover deleted content. The SF-G series boasts a fast write speed up to 299 MB/s, which supports the continuous shooting of high-resolution images with high-performance DSLRs equipped with the UHS-II interface. This card is also compatible with UHS-I devices. With a read speed of up to 300 MB/s, even large files such as 4K or Full HD video captured in XAVC S, or a bunch of high-resolution images by continuous shooting can be quickly transferred to your PC. Spend less time waiting and more time doing. This card offers reliability and durability even in intense use. It is X-ray proof, waterproof, shockproof, and can withstand temperatures ranging from -13 to 185°F. Sometimes things go wrong and data such as photos and files are accidentally deleted. File Rescue is a powerful tool for recovering data that is simple enough for almost anyone to use and is available as a free download to memory card customers. Box Dimensions (LxWxH) 4.9 x 3.9 x 0.6"
128GB SF-G Series UHS-II SDXC Memory Card Kit (2-Pack) is rated 4.5 out of 5 by 182. Rated 5 out of 5 by Mark Webster Media from As good as an SD card gets Since adding a Nikon D500 to my gear, I've been enjoying its wonderfully fast XQD card (SONY 128GB), which even makes transferring 4K video files a breeze (440mb/s read, 400 mb/s write.) I decided to bite the bullet and spend more than I ever have on an SD card for this SONY UHS-II version to make them as comparable as possible. While not as fast as the XQD, you get what you pay for here. By SDXC standards, it's screaming fast. For a working DSLR photographer or videographer, reliability is crucial and time is money. I've been strictly a SanDisk user until now for their reliability, but at least in the short term, the SONY cards have worked flawlessly. Rated 2 out of 5 by Timothy from Under performs cards spec'd much lower and older 2nd try to post this...? I though these cards offered some value, but they benchmark (20MB/s seq write) at half the speed of my old Samsung PRO+ 64GB card - both in a UHS-I and USH-II reader with USB3. The Hoodman 2000x cards benchmark (180MB/s) close to published , so it's not the setup. I think Sony is diverting the best stuff to the G series. If money is tight these might be a good choice, but expect nowhere near the published specs or even the benchmarks from last year on the review sites. Rated 5 out of 5 by Charles L. from Fast Memory Card Sonny 32GB SF-G Series UHS-II SDHC Memory Card works perfectly. I love the rapid speed transfer since I take over 400 pictures or more at an outing. I have my camera set to save my images in RAW and JPG format which generates over 800 files that will be downloaded. When I become more experienced I'll only save to RAW format. Note: An experienced photography friend taught me to use the camera to reformat all my memory cards and not to use the computer when erasing images from the memory card. Using his tip to date I have not had any camera card glitches. Rated 5 out of 5 by Bruce from Worthy speed upgrade If you have a camera and memory card reader that are capable of reading/writing to UHS-II memory cards, this card is definitely worth it. I'm using it in the UHS-II compatible slot in my Olympus OM-D E-M1 MkII camera and compared to my UHS-I card which was capable of 95 MB/s, this card stores images and empties the camera's buffer considerably faster. When importing to my PC with a UHS-II compatible card reader (via USB 3.1 port), I'm getting read speeds of 295 MB/s which is very close to the advertised speed. Great card! Rated 5 out of 5 by Vinod from Dropping frames with GH5 but recording RAW flawlessly! Used two of these cards on a recent filming schedule with a GH5. At 400 megabits/sec the Panasonic GH5 camera stopped after 17 to 19 seconds and flashed a message that the card did not support the data rate. Checked 150 and it was doing well. Was planning to return the cards to B&H. But then tried each card slot separately and found that the error occurred only in slot 1 and not in 2. It was clearly the camera fault and nothing to do with the cards! Used the Black magic drive test and found that the cards could sustain a data rate of 84 Megabytes/sec. Again I tried it on a friends BMPCC 4K and its recording Pro res and RAW flawlessly! Amazing ! Rated 4 out of 5 by Macky from Makes a difference! Wanted to give this a 5 star but it falls short of what I was expecting. Let me explain. I shoot with a Sony A9 and as most of us know that camera shoots at 20 FPS. Naturally that means you need a card that can keep up. This card reads and writes 3x faster than all my other cards but even with this much speed it still not fast enough. Now one can argue that Sony should have used XQD for the A9 as that would have been able to keep up. Most of the time this card gets the job done, I’d like to see them make a faster card. Over all I would recommend this card if you shoot in burst mode a lot and need that buffer to clear faster than your current card allows. Rated 5 out of 5 by Michael from Exceptionally Capable SD Card These Sony SD's were purchased for the X-T3 my wife purchased as a gift for me. After a bit of web researching and conversations with better photographers, I set out to buy cards suitable for the X-T3's capabilities. After only two days of shooting, there are enough experiences to warrant the following: Both the X-T3 and the Sony 64GB SF-G Series UHS-II cards are phenomenal. Set at "CH," two bursts totaling twenty shots were fired without hesitation. Quickly checking, expecting the camera to be professing, all twenty shots were recorded before the camera was turned around. Wow!!! Will this card work with thenew firmware update V2.0 ofPanasonic lumix GH5 ? Can these work in the Blackmagic Video Assist 4k running 2160p25? Yes this card will work very well in the Video Assist 4K. Will this card work with &curren;K in sony z150? Yes, the Sony 64GB SF-G Series UHS-II SDXC Memory Card would be compatible for use with the Sony PXW-Z150 4K XDCAM Camcorder. Will this card work with my Nikon D850? Yes, the Sony 64GB SF-G Series UHS-II SDXC Memory Card, B&amp;H # SOSD64GBUII, would be fully compatible for use with the Nikon D850 DSLR Camera. Is this card compatible for the Panasonic AG-UX180 slow motion? How will this work for hybrid shooting with the A7iii? Will it be able to handle 4K? Yes, the Sony 128GB M Series UHS-II SDXC Memory Card is rated as UHS-II so it is fast enough for the highest recording settings of the A7 III. How do I get the image recovery software? Sony Memory Card File Rescue Software would be available as a free download to Sony Memory Card customers after purchase. The information for download would be included in the memory card packaging, or you may contact Sony for assistance with downloading the software. Is the Sony rx10 iii fully compatible with this UHS-II card and support use of the second row of pins?